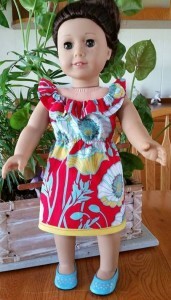 Wow, it’s been wonderful to see so many of you enjoying my new Fun ‘n Frilly Top pattern and I’m so glad that I included the bonus dress pattern as it seems that many of you have been making the fun ‘n frilly dress. Within hours of the pattern being released, Joan had bought the pattern and made her first dress. She then made another 3 dress I think it was that day and the cat print one shows how she has added a pretty pink belt made from Fold Over Elastic to complete the look and the next one shows how she has substituted wide lace for the frill. This makes it a lovely feminine dress. 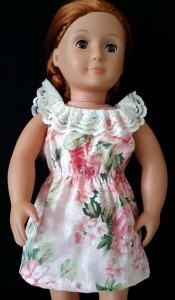 Karen received the Fun ‘n Frilly pattern as a thank you for suggesting the name for this pattern and it didn’t take her long to make her first couple of dresses. What a lovely surprise when she told us that she had already sold this beautiful Unicorn dress only days after making it! The Yellow dress was made by Peggy. This print is perfect for this dress, it’s so cute. I love the way another Karen has used a contrasting fabric for the frill, it makes it a stand out feature. Laurie used a lovely bright print and trimmed the hem nicely with yellow to match the flowers. Great idea. At last, we have a Fun ‘n Frilly Top! Yes, Kathy made this sweet top and used a contrasting blue for the neck frill, it looks adorable. But the best thing about Kathy sharing her photo is that she also shared with me how a little tip I gave in my step-by-step videos has helped her finishing off her seams. I absolutely love it when someone gets an ‘aha’ moment. 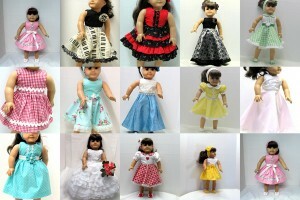 And the last of the Fun ‘n Frilly dresses for this blog. Jane dress has turned out beautifully – no need for any extra trims. Now let’s have a look at some other patterns that you have been busy making over this last month. Janyt sent me this photo of her gorgeous Winter Nightie. I love how she has used lace as the frill on the bottom, it makes it so pretty. 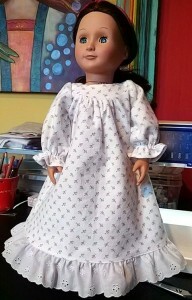 Margaret did my How to Make Doll Clothes course back in September last year and has purchased many patterns since then. Although she hasn’t sent me in a photo I just had to share her email as the last part truly made my week. Hearing how I’ve helped someone go from not liking sewing, to loving it is so heartwarming. 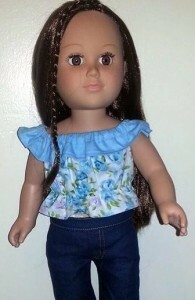 Every now and then I hear from customers who have started selling their doll clothes either online or at local markets. It’s great to see Elaine taking her love of sewing to this level. My Wedding Dress pattern continues to be a very popular pattern and I love seeing photos especially when you have made your own special tweaks. Lynda’s grandchildren had difficulty keeping the veils on the doll’s head using the slide comb so she has come up with a great solution and I am sharing it here just in case it works better from someone else who has had this problem too. ‘We finally got all the “girls” together in their wedding dresses so I’m sending you a picture! 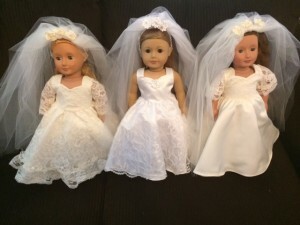 The two ivory dresses are for my granddaughters’ dolls and the white one is for their best friend’s doll. They were fun to make but I couldn’t help customizing a bit here and there! We had a few issues keeping the veils on the dolls. I made headbands out of decorative (ruffled) lace, wove the band through the teeth of the comb and stitched it into place. It worked like a charm. Even the youngest child can put the veil on now, and best of all, they stay in place! Wow, what a busy month we’ve all had. Thank you to everyone who has sent in their photos and shared their sewing stories with us, it all helps to inspire and encourage each other so please continue to share your photos and stories. And don’t forget that everything is 20% off this month with March Madness. Use coupon code Madness20 during checkout to receive 20% discount on ALL patterns and my How to Make Doll Clothes video course. Valid until midnight 31 March, 2018.